Cut beading wire into 2 equal pieces. String one wire end through a crimp bead then through one half of the TierraCast toggle clasp and back through the crimp bead. Crimp the crimp bead to secure wire. Cut any remaining wire. Cover the crimp bead with the crimp cover. String on one bead art. 5328 3mm crystal and three beads art. 5328 4mm aquamarine from the Swarovski crystal assortment. Repeat pattern 15 times and end with one more Swarovski bead art. 5328 3mm crystal. Repeat step 2 using one of the "petals" in the Swarovski filigree art. 62026 in place of the clasp. Repeat steps 2 - 4 for other side of necklace. Use the other half of the TierraCast toggle clasp for one end and the "second" petal over on the filigree. Leave one petal open between the two sides of the necklace. Cut the 20 gauge wire in half and use one half to create a beaded eyepin using the Swarovski bead art. 5040 6mm aquamarine. (Make a small loop on both sides of the bead.) Repeat for other bead art. 5040 6mm aquamarine. Attach one beaded eyepin to the bottom petal of the filigree attached to the beaded necklace (art. 62026). Attach the other end of this beaded eyepin to one opening in the filigree art. 62003 from the Swarovski crystal assortment. Attach the second beaded eyepin to the bottom of art. 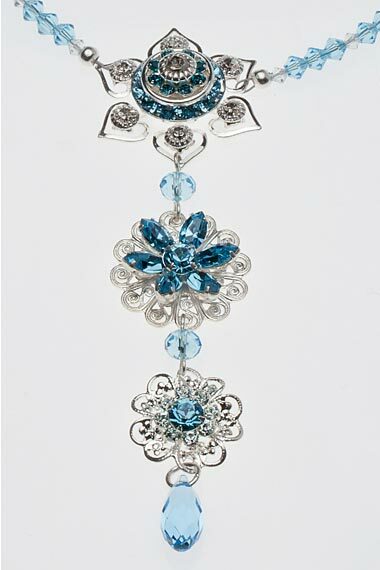 62003 and attach the bottom of this beaded eyepin to the top of the Swarovski filigree art. 62000. Open the 6mm jumpring and attach the pendant art. 6010 from the Swarovski crystal assortment. Attach this to the bottom of the last filigree and close the jumpring to secure.